When two-time world champion Zoe Hickel arrived in Shenzhen, China, about six months ago to join that country's first professional women's hockey team, she didn't know what to expect. 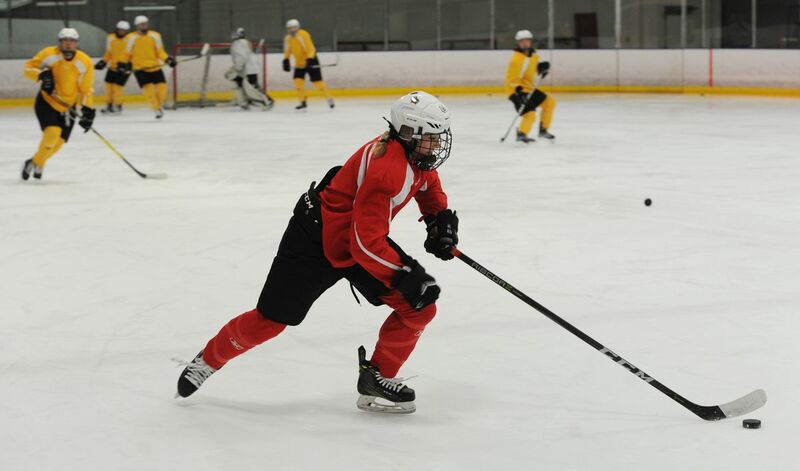 The Anchorage woman had to adjust to players who were new to playing at a high level, she had to get used to exotic foods like chicken feet and cow stomach, and she had to overcome a language barrier both on the ice and in her day-to-day activities. It was a culture shock at first, but Hickel has settled in nicely. Fast-forward to January, and Hickel's Kunlun Red Star team is tied for the points lead in the Canadian Women's Hockey League and making a stop in Anchorage for an exhibition game against a makeshift Alaska team. The Kunlun Red Star, a team formed this season with 10 players from the Chinese national team and 10 from North America, will play a team made up of former college and pro players, both men and women. The game is set for 1 p.m. Friday at the Subway Sports Centre. "It was just an idea we had because we were supposed to be in Toronto for about three weeks … but then we didn't have games this weekend," Hickel said. "We just wanted to make sure we had a game where everyone could play, and it's fun for the community and fun for us." Hickel played boys hockey at East High before going on to play college hockey at Minnesota-Duluth and for the U.S. national team that won world championships in 2015 and 2016. Her pro career took her to the Boston Pride of the National Women's Hockey League in 2015 and to the Kunlun Red Star last summer. Hickel scored the Kunlun Red Star's first goal on Oct. 21, in a 2-1 loss to Markham Thunder of Canada. She's the team's seventh-leading scorer with 5-12—17 totals in 15 games. Part of Hickel's job is to help the sport grow in China. Hockey is becoming more popular there, she said, and China hopes to qualify for the 2022 Olympics in Beijing. "We're there to pass on what our experience is, because a lot of us have played at the highest level, so to be able to pass that along into a new and developing program is huge," Hickel said. The team has improved quickly and owns an 11-4 record after losing three of its first four games. The Kunlun Red Star have posted 22 league points — tied for most in the CWHL. "All the Chinese players like Zoe," said defenseman Zhixin Liu. "She always helps the girls, teaching the girls how to play hockey, how to (shoot) and about the hockey life, how to eat. "We appreciate the North American girls (who) come to China to play hockey and help the China hockey make history." Hickel said she feels at home in Shenzhen. She enjoys seeing a stray dog called "Wonzai" every day during the team's 10-minute jaunt to the rink for practice. "We'll see what happens, but I would love to adopt her and bring her home with me," Hickel said. Hickel said she has enjoyed exploring Chinese cuisine, but one of her favorite meals is when the team does taco night once a week. "We taught our cook how to do taco night, because he didn't really know Western food," she said. "We showed him how to make guacamole and salsa, and he tried it and he actually really liked it." On Friday, the Kunlun Red Star will play an Alaska team that includes players like Dimond coach Dennis Sorenson, UAA grad Kory Wright and the Molle siblings Bryan, who played at UAF; Dustin, who played at UAA, UAF and for the Alaska Aces; and Candace, who played at North Dakota. "It's so weird to have my team here, my professional team in Anchorage, Alaska," Hickel said. "It will be fun to be back on the ice (here), especially with these guys." Stephan Wiebe writes about all things Alaska sports.